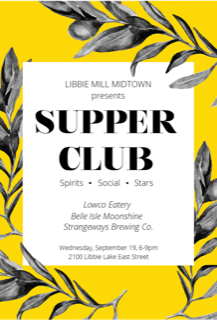 Supper Club at Libbie Mill Wednesday Sept 19! Come and enjoy dinner under the stars with us! “Supper Club” is our chic new pop-up waterside dining experience on the pier at Libbie Mill Midtown. A delicious food truck cuisine, table cloths, and music transform the pier into your new favorite bistro. This month’s “Supper Club” will be featuring sweet and savory southern fare from our friends at LOWCO Eatery. We’ll be sipping cocktails from Belle Isle Moonshine and pouring STRANGEWAYS BREWING brews as we enjoy music by the John Bradberry Trio! Bring your friends, family and neighbors!